Two amazing packet tricks combined on one DVD. These are fun visual tricks that are easy to learn! Join Paul Hallas on his DVD collection of Packet Trick Treasures! All Cards Included! 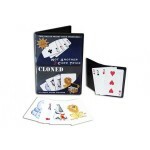 This is one of the best 3 card packet tricks using 4 cards! Paul Hallas gives you step-by-step instructions how to perform this great packet trick. This is a great visual opener and is one of the easiest tricks you can learn! Explore the magic of Cloning! Paul Hallas will teach you step-by-step how to perform this packet trick along with a great ending that will amaze your audience! Don’t worry cloning is perfectly safe just ask the animals!